Here we are almost at the end of our very first week, so I thought I’d take a bit of time to reflect on what we’ve gone through so far and share some of the questions that sprang up during our two reading groups from Wednesday and Thursday. Genesis always brings up questions about some of the mysterious characters we find in its chapters. The Nephilim were brought up in both groups, and I came prepared with the conclusive response: we just don’t know. There are some theories you can easily search and find on the internet, but we can’t be certain. Sometimes we need to be accepting of mystery and recognize we may not be able to know all things in all ways. But this story is just another example in Genesis about how creation continued to break from the perfect vision God had for it in the opening chapters. Adam and Eve seek to be like God, knowing good and evil. In their pride and disobedience they sin against God and their curse affects all creation. Adam and Eve were “fruitful and multiplied,” but Cain and Abel continue in their pattern of sin. Cain was jealous of his brother and resented God’s favor, so he killed Abel. Wickedness spread over the world as God’s order was resisted and people sought to be their own Lord. The Nephilim fall in line with that, and their entry into the story comes just before the flood, in which we see that God is not detached from his creation. All these rejections of him and his purposes for creation and the way in which his perfect creation is being perverted saddens God. It says in Genesis 6 that God is grieved. God made this world and declared it good. He intended for us to be in relationship with him, and for that relationship to be ordered properly. But we see in Genesis that our sin distorts that relationship and in fact breaks it. There are many examples of the ways in which humanity disobeys and too often seeks to take the place of God or do the work that God alone can do. The restoration of this relationship is another work that God alone can do. We turn to John and see again that God is not detached from creation, rather God did the unbelievable. God came into this fallen, wicked world in order to save it. There is a work that he alone could do, so to complete that work Jesus Christ came to us. Jesus Christ in John is shown to be greater than all that came before him, for he alone is the one sent from God, and in fact he is God. Another mysterious figure is Melchizedek in Genesis, and later in the book of Hebrews Jesus is compared to him. But just as when he is compared to Jacob or Abraham in John, Jesus is seen as one who is even greater when he is compared to Melchizedek . 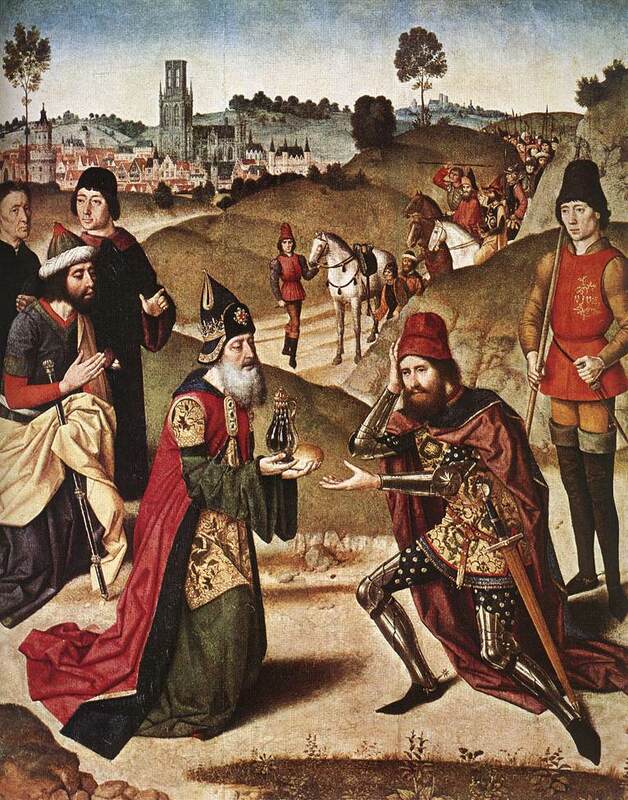 Melchizedek is a priest and king who blesses Abraham, signifying a place of honor over Abraham. But Jesus is the one priest who we now have, who is even greater still. As you read through the Old and New Testaments together you will see the way that Jesus fulfills the signs, symbols, and actions of the Old and how he always does so in a way that is greater. The old is but a shadow of the reality that is in Christ (Col 2:17). We see that exemplified as well in John 3 as Jesus compares himself with a snake lifted up by Moses that brought healing (Numbers 21:8-9), yet Jesus brings healing in a more amazing way and the life he gives is eternal. If you’ve had more questions or have insights from this last week, I’d love to hear from you. I’m praying for you as you continue this journey. I hope week one has been a joy. Can you please explain a bit about Genesis 9:4….what is the meaning, what is being said? The guidance here is on how food should be prepared and eaten and the people are prohibited from eating meat while an animal is still living. It is the start of some of the dietary laws the Jews had that were to keep them pure and differentiated from other people groups. What would you be able to “eat” while it was still living? Or what is an example of what you “can’t eat” because it was still living? Thanks so much for your reply Casey!!!! It is about how we should eat, that animals should be properly killed and prepared first. You wouldn’t eat lamb if you hadn’t first let the blood out correctly. There’s also something to it in regards to their view on blood. You may have heard something about it on Sunday during the sermon, too. Sorry if my wording was a bit wonky–but if you have more questions, let me know.